I received my doctorate in 2015 from the University of Arizona’s School of Natural Resources under Dr. Melanie Culver. My dissertation focused on how the enduring processes of time, climate, and adaptation have shaped the evolution of one of the Sonoran Desert’s most charismatic reptiles, the Desert Tortoise, Gopherus morafkai. Specifically, I used a genomic approach to describe the phylogeography of the desert tortoise: how its genetic variation fits the biogeography of the landscape. My objective was to resolve taxonomic uncertainty of the Sonoran desert tortoise by defining the mechanisms of speciation between the Sonoran and Sinalon lineages. 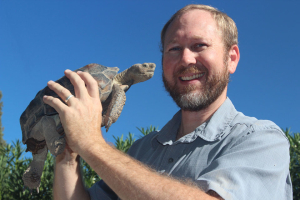 By clarifying the evolutionary processes that influence the distribution of desert tortoise lineages, this research will directly inform efforts to preserve the evolutionary potential of these taxa. This international project involved the collaboration of the US Geological Survey, Tucson Herpetological Society, Arizona Game and Fish Department, and the Comisión de Ecologíca y Desarollo Sustentable del Estado de Sonora in Mexico. Ultimately, understanding the evolutionary history of desert tortoises will not only clarify the forces that have driven the speciation of this group, but it will also contribute to our knowledge of the biogeographic history of the southwestern deserts and how diversity is maintained within them. I really look forward to working with an artist on this project. While I try to approach things creatively, I definitely lean far on the logical side. I would like to work with someone who can inspire me artistically, and help me find new ways to express my science through art. A list of my actual projects/papers can be found on Google Scholar. And this is a really nice summary of the objectives of my dissertation that Eric Magrane wrote for the Institute for the Environment Website.